EcoTubes™also known as Geotextile Tubes, or Geotubes® are dewatering bags that are constructed from high strength, permeable geotextile fabrics. The geotextiles themselves possess unique filtration and strength characteristics in order to withstand the stresses associated with the filling and placement of the tubes including: abrasion, tearing, puncturing and flattening. 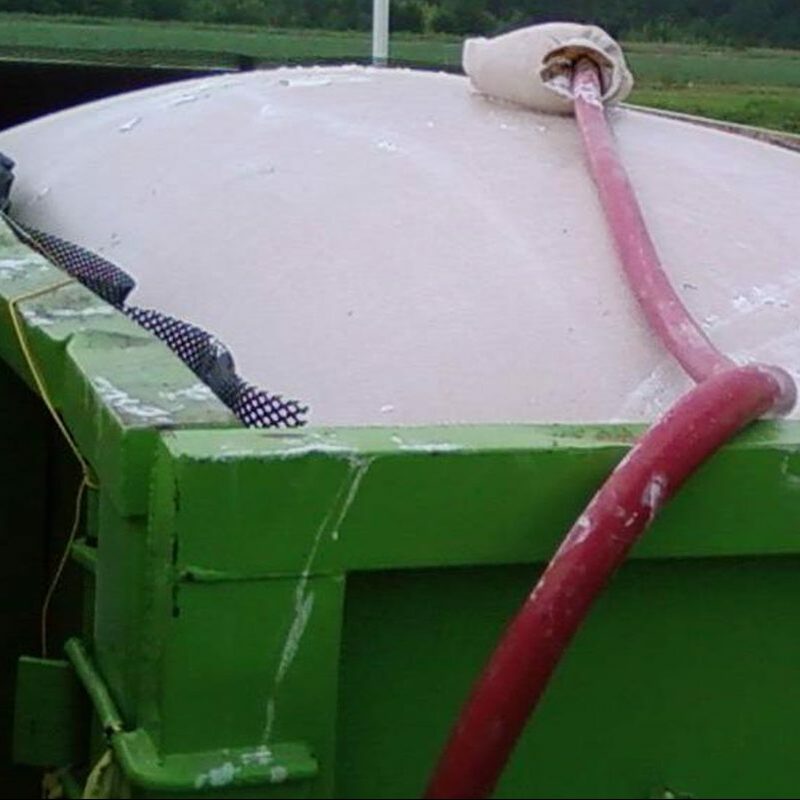 They can be used to dewater and reduce the volume of any fine grain sand, sludge, contaminated soil, dredge waste or any other material that can be hydraulically transported. High strength polypropylene is the most common material used for manufacturing geotextile tubes in dewatering applications. It dewaters more quickly and efficiently than polyester and can withstand higher pH levels. High strength polyester geotextile fabric is used for tubes that are mainly used in beach and shoreline protection applications. Polyester geotextiles can be produced in much higher strengths than polypropylene (in excess of 3,000 pounds) and can be coated more easily and by a wider variety of materials for added protection in harsh environments. They also hold their shape better, making them better suited for use along shorelines. 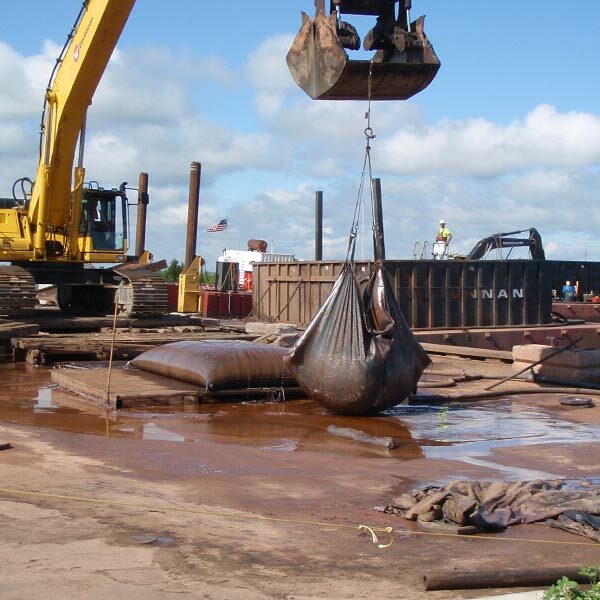 EcoTubes™ / Geotextile Tubes are ideal for large dewatering and sludge removal projects. They are an alternative to sludge lagoons, wet hauling, sand drying beds, wedge wire systems, presses and other mechanical dewatering methods. Geotextile dewatering tubes offer significant cost savings. They dewater faster than open-air pits and do not require standard heavy equipment. Their ability to be stacked vertically creates a smaller footprint, allowing the project site more space to work. If the discharge water is clean and clear it can be reused or discharged into nearby waterways or storm drainage systems, making them an environmentally friendly option. Contact our sales office at 609-971-8810 so that we can discuss the use of EcoTubes™ / Geotextile Tubes for your next project. High strength polyester geotextile fabric is used for tubes that are mainly used in beach and shoreline protection applications. Polyester geotextiles can be produced in much higher strengths than polypropylene (in excess of 3,000 pounds) and be coated more easily and by a wider variety of materials for added protection in harsh environments. They also hold their shape better, making them better suited for use along shorelines. EcoTubes™ / Geotextile Tubesare ideal for large dewatering and sludge removal projects. They are an alternative to sludge lagoons, wet hauling, sand drying beds, wedge wire systems, presses and other mechanical dewatering methods. Geotextile dewatering tubes offer significant cost savings. They dewater faster than open-air pits and do not require standard heavy equipment. Their ability to be stacked vertically creates a smaller footprint, allowing the project site more space to work. If the discharge water is clean and clear it can be reused or discharged into nearby waterways or storm drainage systems, making them an environmentally friendly option. Sediment filter bags are smaller disposable bags manufactured from heavyweight nonwoven geotextile filter fabric or specialty woven monofilament geotextiles. They are specifically designed for rapid onsite dewatering of sediments from any water pumping activity. Once bulk dewatering takes place, self weight consolidation and confining pressure of the geotextile bag itself continue the process. We offer standard pump filter bags manufactured from nonwoven geotextile fabric with an inlet port to accommodate a 4-6” pipe. Stock sizes are 7.5’ x 15′, 15’ x 15’ and 15’ x 30′. Custom size bags and materials are also available. Flooding damages property and endangers the lives of humans and other species. Rapid water runoff causes soil erosion while sediment deposits pollute or completely destroy wildlife habitats. Floods also interfere with drainage and economic use of lands. They cause structural damage to bridge abutments, sewer lines and other structures. The financial impact of flooding is also significant, costing millions of dollars each year. 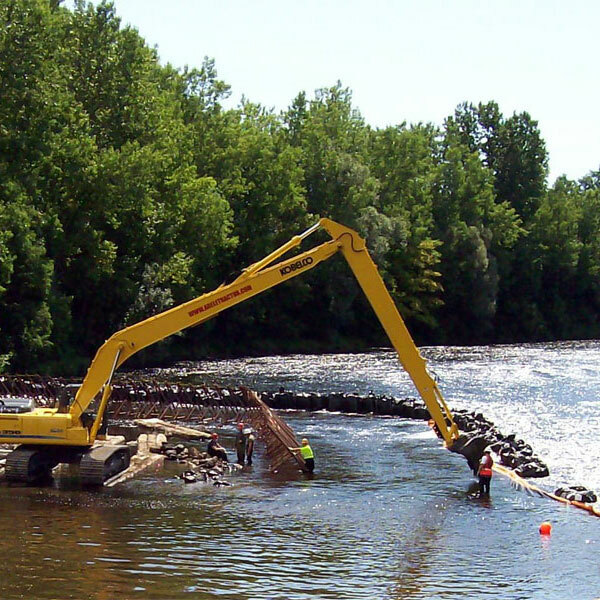 We offer a complete line of flood control and water diversion solutions for every project. Please call us at 609-971-8810 for more information. We welcome the opportunity to be of service. 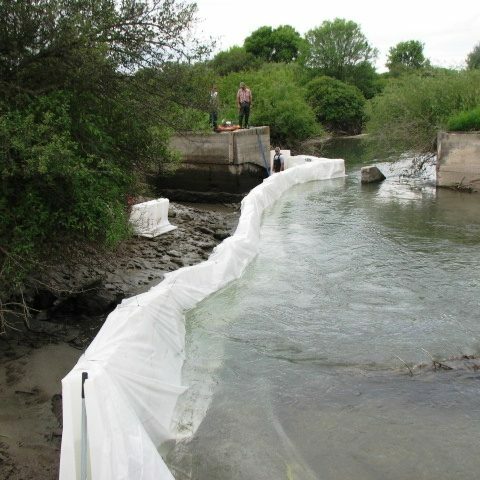 The use of bulk bags includes temporary dams for stream diversion or onsite exclusion zones. Filling a 3’ x 3’ x 3’ bulk bag with sand provides an efficient barrier. 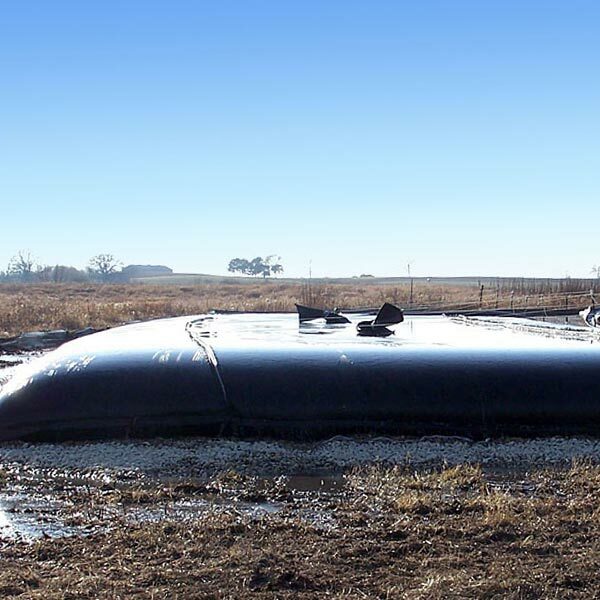 When stacked and faced with an impermeable liner, the bulk bag dam is also a safe and cost-effective alternative to inflatable structures. 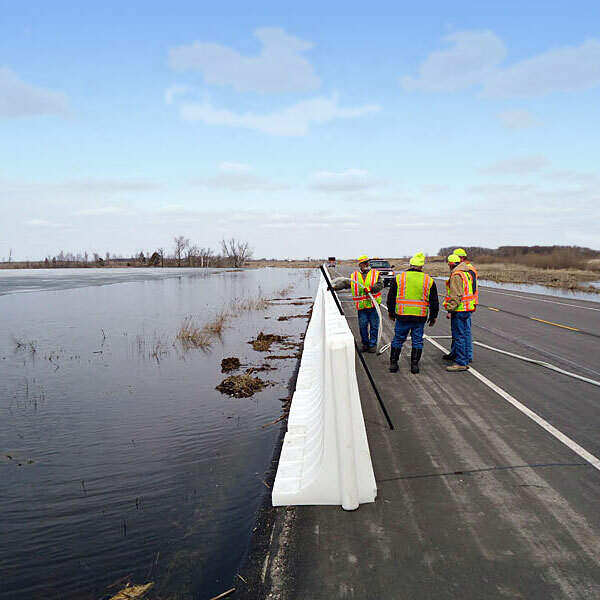 In addition, bulk bag dams can be rapidly deployed and the height adjusted to site-specific conditions. Please call us at 609-971-8810 so we can show you how to use the bulk bag dam on your next project. Muscle Wall is a sustainable and diverse tool for use in oil and gas containment, stormwater management, erosion and flood control. It is made from LLDPE plastic molded into 2′ and 4′ high barricades that easily slot together to form a unique barrier. It keeps contents in as a secondary containment while keeping water out as an exclusion barrier. In addition, Muscle Wall helps to meet regulatory requirements for stormwater management and oil and gas secondary containment. Muscle Wall is also cost-effective and reusable. It is both easy to deploy/dismantle and clean up. Consider this versatile tool for your next project or emergency. Call us at 609-971-8810 for more information.